I say this because it is my deepest conviction that if his thought remains unknown it will be difficult to get very far, to achieve real socialism, really revolutionary socialism, socialism with socialists, socialism and communism with communists. I’m absolutely convinced that ignoring those ideas would be a crime. That’s what I’m putting to you. 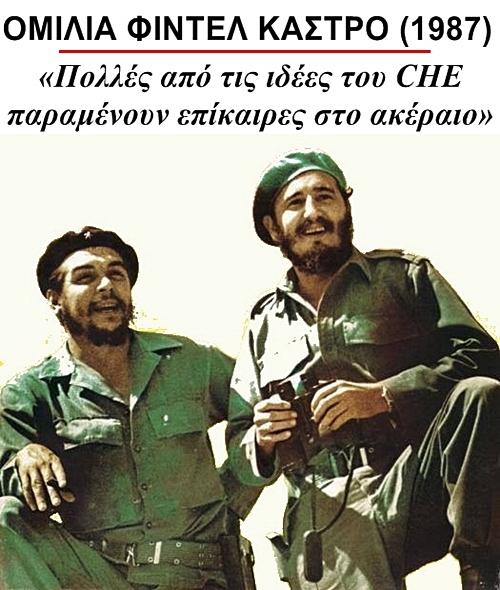 We have enough experience to know how to do things; and there are extremely valuable principles of immense worth in Che’s ideas and thought that simply go beyond the image that many people have of Che as a brave, heroic, pure man; of Che as a saint because of his virtues; as a martyr because of his selflessness and heroism. Che was also a revolutionary, a thinker, a man of doctrine, a man of great ideas, who was capable with great consistency of working out instruments and principles that unquestionably are essential to the revolutionary path. Capitalists are very happy when they hear people talk about rent profit, interest, bonuses, superbonuses; when they hear about markets, supply and demand as elements that regulate production and promote quality, efficiency and all those things, for they say, “That’s my kind of talk, that’s my philosophy, that’s my doctrine,” and the emphasis that socialism may place on them makes them happy, for they know these are essential aspects of capitalist theory, laws and categories. We ourselves are being criticized by quite a few capitalists; they try to make people think that the Cuban revolutionaries are unrealistic, that the thing to do is go for all the lures of capitalism; that’s where they aim their fire. But we’ll see how far we get, even riding on the old nag full of sores, but correctly led, for as long as we don’t have anything better than the old nag. We’ll see how far we get in the rectification process with the steps we’re taking now. That’s why on this, the twentieth anniversary, I’m making an appeal for our party members, our youth, our students, our economists to study and familiarize themselves with Che’s political and economic thought. Che is a figure with enormous prestige. Che is a figure whose influence will grow. Needless to say, those who feel frustrated or who dare to fight Che’s ideas or use certain terms to describe Che or depict him as a dreamer, as someone who is out of touch with reality, do not deserve any revolutionary’s respect. That’s why we want our youth to have that instrument, to wield that weapon, even if for the time being it only serves to say, don’t follow that mistaken path foreseen by Che; even if it only serves to increase our knowledge; even if it only serves to meditate or to delve deeper into our revolutionary thought. I sincerely believe that more than this ceremony, more than formal activities, more than all the honors, what we accomplish, is the best homage we can pay to Che. The work spirit that is starting to appear in so many places and that is evident in so many examples in this province: those workers in Viñales who are working twelve and fourteen hours building minidams, starting them and finishing them one right after the other, and building them at half what they otherwise would have cost, with the result that in comparison with other projects — were we to use a capitalist term, although Che was opposed to even using capitalist terms when analyzing questions of socialism — were we to use the term profitability, we could say that those men on the minidam construction brigade working in Viñales are more than 100 percent profitable — more than 100 percent profitable! Che devoted absolute, total, priority attention to accounting, to analyzing expenditures and costs, cent by cent. Che could not conceive of building socialism and running the economy without proper organization, without efficient controls and strict account of every cent. Che could not conceive of development without an increase in labor productivity. He even studied mathematics to use mathematical formulas to implement controls and measure the efficiency of the economy. What’s more, Che even dreamed of computers being used in running the economy as an essential, fundamental and decisive way of measuring efficiency under socialism. And those men I have mentioned have made a contribution: for every peso spent, they produce two million. They and those working on the Guamá Dam, those working on the canal, those working on the thruway to Pinar del Río, those who are going to work on the Patate Dam, those who have started to work on roads and the water works in the city — there are a number of groups of workers who are carrying out real feats with pride, honor, discipline, loyalty to work. They are working with great productivity. A few days ago, we met with a group of construction workers building an avenue in the capital. They’re all members of the party or the Union of Young Communists, and they’re outstanding workers, about 200 men in all. Rather than linking their wages to production norms — I don’t mean to say that this is negative, there are a number of fields where it is perfectly correct — since they do move about in powerful trucks and machines, we don’t have to tell them to work more but rather to work less. People like that are doing a lot, sometimes too much with too much effort. At times, we’d have to tell them to take less trips because at the proper speed they can’t make twenty-five trips with materials in a truck but twenty, because we don’t want them to get killed. What we’re interested in is not only what they do but the quality with which it is done. We told them we were much more interested in the quality than the quantity. Quantity without quality is a waste of resources; it’s throwing away work and materials. Awareness of the need for water conservation, which had virtually died out in the shameful period when nothing was finished, is being regained, and the province of Pinar del Río is playing a leading role in this regard. The road brigades in the mountains of Pinar del Río are working with the same spirit, and the awareness of the need for water conservation is spreading all over the country with the desire to build roads and highways and improve the efficiency of our economy, factories, agriculture, hospitals and schools, to go full speed ahead with the economic and social development of the country. Fortunately, during these years we have trained a large number of people with a high degree of technical knowledge and experience — university graduates and intermediate-level technicians. How does this compare to what we had in the early years of the revolution? When Che headed the Ministry of Industry, how many engineers did the country have, how many technicians, designers, researchers, scientists? Now we must have about twenty times the number we had then, perhaps more. If he had been able to draw on the collective experience of all the cadres that we have now, who knows what we could have accomplished. Let’s look at the medical sector alone. Back then, we had 3,000 doctors and now we have 28,000. Each year our twenty-one medical schools graduate as many doctors as the total number in the country at that time. What a privilege! What a power! What a force! As of the next year, we’ll be graduating more doctors than those who stayed in the country in the early years. Can we not do what we set our minds to in the field of public health? And what doctors they are! They work in the countryside, in the mountains, or in Nicaragua, Angola, Mozambique, Ethiopia, Vietnam, Kampuchea, or at the end of the world! Those are the doctors trained by the revolution! I’m sure Che would be proud, not of the shoddy things that have been done with such a two-bit profiteering mentality; he’d be proud of the knowledge and technology our people have, of our teachers who went to Nicaragua, and the 100,000 who offered to go! He’d be proud of our doctors willing to go anywhere in the world, or our technicians, of our hundreds of thousands of compatriots who have been on international missions! I’m sure Che would be proud of that spirit just like we all are, but we cannot permit what we have built with our heads and hearts to be trampled on with our feet. That’s the point, that and the fact that with all the resources we have built up, with all that force, we should be able to advance and take advantage of all the potential opened up by socialism and the revolution to get people to move ahead. I would like to know if the capitalists have people like those I mentioned. They are extraordinary internationalists and workers; you have to talk to them to see how they think and feel, to see how deeply thy love their work, and this is not because they’re workaholics but because they feel the need to make up for lost time, time lost during the revolution, time lost during almost 60 years of neocolonial republic, time lost during centuries of colonialism. To those who encourage laziness and frivolity, we will say, “We will live longer than you, no just better than you, or like we would live if everyone were like you. We will live longer than you and be healthier than you because with your laziness you will be sedentary and obese, you will have heart problems, circulatory ailments, and all sorts of other things, because work doesn’t harm your health, work promotes health, work safeguards health and work created man.” These men and women doing great things must become models. We could say that they’re being true to the motto, “We will belike Che!” They are working like Che worked or, as Che would have worked. When we were discussing where this ceremony should be held, there were many possible places. It could have in the Plaza of the Revolution in the capital; it could have been in a province; it could have been in one of the many workplaces or factories that the workers wanted to name after Che. We gave the matter some thought and recalled this new and important factory, the pride of Pinar del Río, the pride of the country and example of what can be done with progress, study, education in this province, which in the past was so neglected and backward and now has young workers capable of running such a complex and sophisticated factory. We need only say that the rooms where the circuits are printed must be ten times cleaner than an operating room to meet the required standard. It was necessary to do such complex work, with such quality and good equipment, and Pinar del Río residents are doing it marvelously. When we toured it we were deeply impressed and talked with many compañeros, the members of the Central Committee about what they were doing in the factory, which is advancing at a rapid pace; what was being done in construction. We realized the great future of this factory as a manufacturer of components, of vanguard technology, which will have a major impact on development and productivity, on the automation of production processes. When we toured your first-rate factory and saw the ideas you had which are being put into practice, we realized it would become a huge complex of many thousands of workers, the pride of the province and the pride of the country. In the next five years, more than 100-million pesos will be invested in it to make it a real giant. When we learned that the workers wanted to name it after Che because he was so concerned with electronics, computers and mathematics, the leadership of our party decided that this was where the ceremony marking the twentieth anniversary of Che’s death should be held, and that factory should be given the glorious and beloved name of Ernesto Che Guevara. I know that its the workers, its young workers, its dozens and dozens of engineers, its hundreds of technicians will do honor to that name and work as they should. This doesn’t only mean being here fourteen, twelve, or ten hours, for often on certain jobs, eight hours of work well done is a real feat. We’ve seen compañeros, especially many women workers doing microsoldering, which is really difficult work that requires rigor and tremendous concentration. We’ve seen them, and it’s hard to imagine how these compañeros can spend eight hours doing that work and turn out up to 5,000 units daily. Compañeros, don’t think that we feel that’s the only way to solve problems is to work twelve or fourteen hours a day. There are jobs where you can’t work twelve or fourteen hours. In some, even eight hours can be a lot. One day, we hope that not all workdays will be the same. We hope that in certain fields — if we have enough personnel, and we will if we employ them efficiently — we can have six-hour workdays. What I mean to say is that being true to Che’s example and name also means using the workday with the right pace, being concerned about high standards, having people do various tasks, avoiding overstaffing, working in an organized manner and developing consciousness. I’m sure that the workers of this factory will be worthy of Che’s name, just as I’m sure that this province was deserving of hosting the anniversary and will continue to be deserving. If there is something left to say tonight, it’s that despite our problems; despite the fact that we have less hard currency than ever before, for reasons we have explained in the past; despite the drought; despite the intensification of the imperialist blockade — as I see our people respond, as I see more and more possibilities open up, I feel confident, I feel optimistic, and I am absolutely convinced that we will do everything we set our minds to! We’ll do it with the people, with the masses; we’ll do it with the principles, pride, honor of each and every one of our party members, workers, youth, peasants and intellectuals! I can proudly say that we are giving Che well-deserved tribute and honor, and if he lives more than ever, so will the homeland! If he is an opponent of imperialism more powerful than ever, the homeland will also be more powerful than ever against imperialism and its rotten ideology! And if one day we chose the path of revolution, of socialist revolution and of communism, the path of building communism, today we are prouder to have chosen that path because it is the only one that can give rise to men like Che and a people composed of millions of men and women capable of being like Che! As [José] Martí said, whereas there are men without dignity, there are also men who carry inside them the dignity of many men! We might add that there are men who carry inside them the dignity of the world, and one of those men is Che!